Picking up on the thread from my Mother’s Day post, The Scent of a Mummy, I’m reporting here on a memorable meeting with my late Grandma’s cousin Nina. It was with some trepidation that I offered to take my Auntie Thelma (my father’s younger sister) on a round-trip to Minehead, on the Somerset coast, to visit her mother’s (my grandmother’s) cousin Nina. So it wasn’t Auntie Thelma’s company that made me nervous, but the prospect of meeting for the first time a lady who was my Grandma”s cousin. Grandma died when I was 12. We were very close, and I still often dream at night of going to her house to tea, and wake up disappointed to realise I can no longer do that in real life. 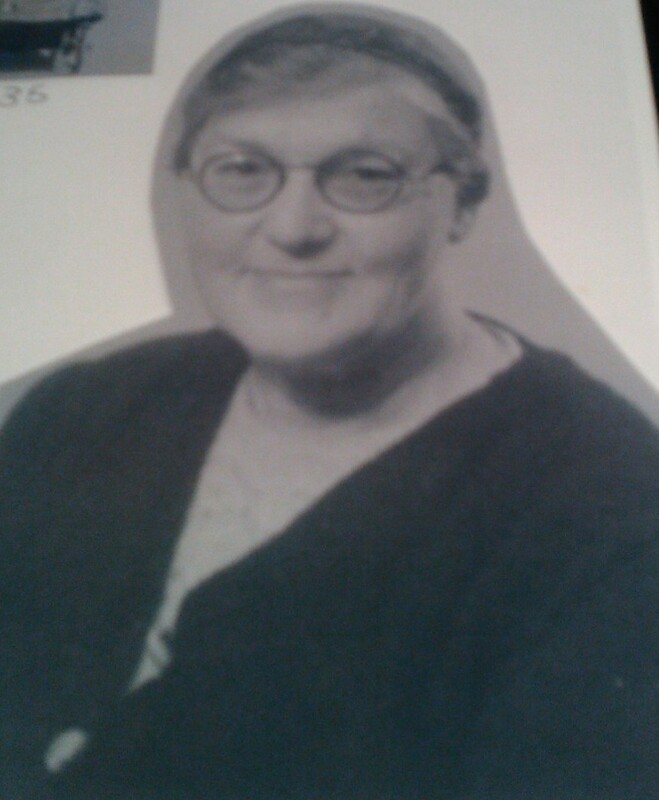 Grandma was born in 1900 (a very neat achievement, I’ve always thought), so would have been 114 if she were alive today. Nina, by contrast, at just 98, is a spring chicken. She is however the oldest person I have ever met. 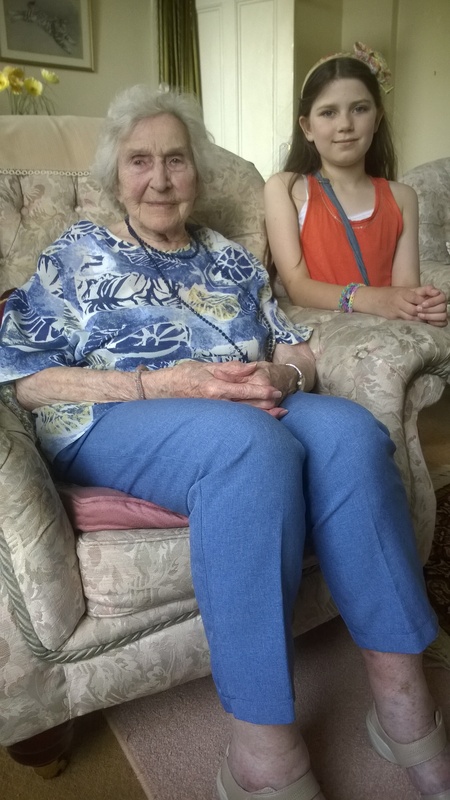 Born in 1916, meeting her was a useful opportunity for my daughter Laura, who is studying the First World War at school this term. We took a special photograph of the two of them together for Laura to take into school the next day for show-and-tell. Her classmates were impressed. Nor was I anxious about being in the company of a very old person. I love old people, and for years was good friends with my next-door neighbours in Hawkesbury Upton, James and Hester Harford, who when they died in 2000 wer aged 96 and 90 respectively. So why the big build-up? 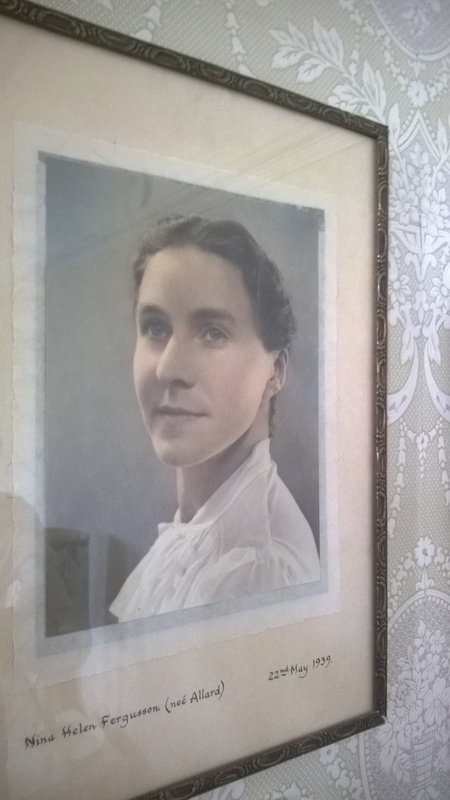 It was because the only photograph that I’d seen of Nina made her look very much like my Grandma. I thought it might be emotionally overwhelming to meet someone who was Grandma’s spitting image, not least because it would fill me with remorse for having never made the effort to meet Nina before. As it turned out, Nina didn’t remind me of Grandma visually (although comparing her photo with Grandma’s I still see a resemblance). But she shared my Grandma’s quick wit, dry humour and candour, and I really enjoyed her company. Although she is less mobile than she’d like to be, using a tea-trolley in lieu of a zimmer frame to get around the house, she is absolutely on the ball, and her conversation is wide-ranging, evocative of past times but anchored in the present, seasoned by the self-knowledge of a very old lady looking back. We enjoyed lunch together, and after a couple of hours took our leave, wary of wearing her out, but not before we’d taken plenty of photographs, both of her old family portraits – there’s a stunning picture of her when she was 20 – and of ourselves as a group: Auntie Thelma, my sister Mandy, my daughter Laura and me. 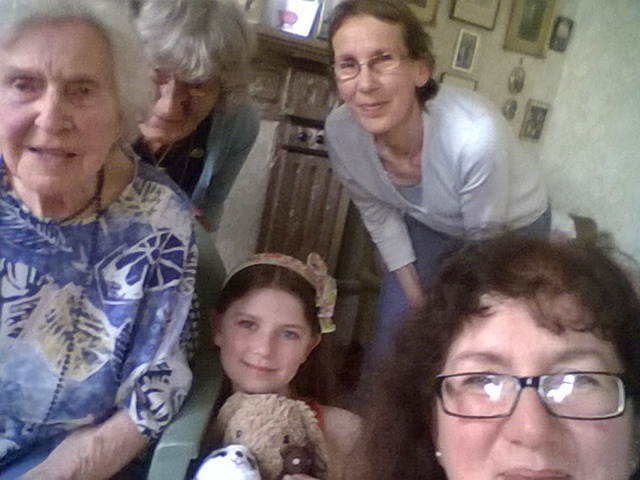 There can’t be many 98 year olds who enjoy being part of a selfie. But the visit was not without its emotional trauma. Having parked outside her apartment block (an elegant building with a view of the sea), as we stood waiting for her to answer the door, I was overwhelmed with a strong perfume that suddenly descended upon me like a cloud for no apparent reason. It was an overpowering floral scent. One moment it was not there; the next it engulfed me. I couldn’t quite identify the fragrance. It was neither honeysuckle, nor freesias (my Grandma’s favourite scent), but it was equally heady, yet I didn’t spot any immediate cause of it in the plain, paved yard in which we were standing. It was only days later, having opened a purchase that I’d made on the bric-a-brac stall at a village fete on Saturday, that I realised which flower it was. What I’d bought was a richly-scented Penhaligon candle, still in its box. Its perfume, exuding so powerfully from the packaging that you could almost see it, was Lily-of-the-Valley. And then the connection hit me: that this was the fragrance that engulfed me as I stood on Nina’s doorstep. And what you need to know to realise why this connection was so extraordinary is this: my beloved Grandma’s first name. It was – of course – Lily. Of all things, hey? That’s so very cool. And I just love the selfie. 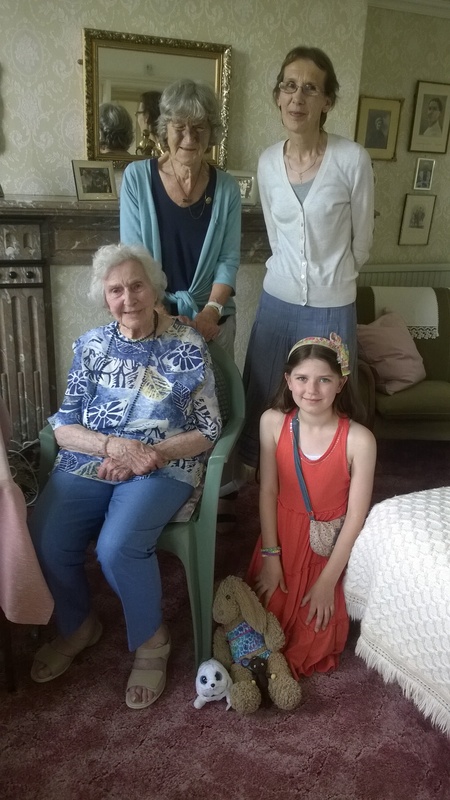 It’s amazing to have four generations in a room, and especially to be there with Nina still having sound mind to share her special perspective. What’s next in my diary? 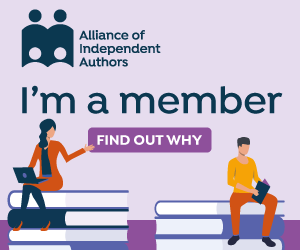 (c) 2010-2017 All of the content on this website is the copyright of Debbie Young unless otherwise stated. Not to be reproduced without prior written permission, or without crediting me as the original author and providing a link to the original article on this website.